Cartoons of the wisest wits in Christian literature smile from the cover of Jeff Lucas and Adrian Plass' second Seriously Funny book as the two pen-pals deliver another collection of letters on life, love and God. Yet it's funny too. Adrian teases Jeff with an invitation to his new communal shower, and Jeff responds suggesting as an possible venue for a small group study. Jeff writes of his heroic resistance in the face of temptations he's no desire to give in to, and Adrian irreverently pens a monologue by the angel who sent a duck, rather than a dove, to endorse John’s baptism of Jesus. The book gives you what you’ve come to expect from the two gifted communicators. Using words and phrases like a surgeon’s scalpel, they cut cleanly through the centuries getting back to what Jesus is really all about. Taking the garden shears to the maze of hedges we call religion, they cut a pathway straight to the life of love and fulfilment God always meant us to enjoy in his company. Both men talk a lot about the heaven we were meant to have and the hell we’ve built – for ourselves, and those we’re supposed to be leading to God. 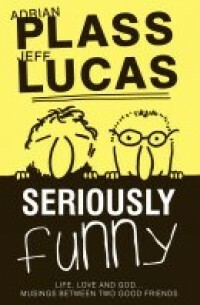 Like ‘Seriously Funny’, ‘Seriously Funny 2’ is at its strongest when the two friends are at their weakest; revealing the worries and woes that trouble us all and lead us to very questions Adrian and Jeff pose for each other – and for God. Strangely, it’s their doubts that make up the most faith affirming chapters of their book; giving you the reassurance that it’s OK have questions without answers, and that you’re not alone. As each writer replies to the concerns of the other, life is explored in greater and more personal detail. Adrian relates a conversation with a young man whose experience of church left him in doubt that Jesus loved him at all. Jeff replies observing how Christians tend to slip into ‘cosmic mode’ by trying to explain such things, advising instead that we shouldn’t try to minimise suffering but give reassurance that pain is not ignored or forgotten by God. 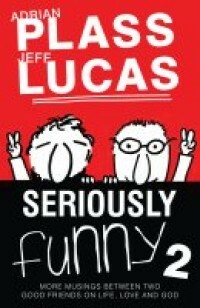 Seriously Funny 2 is gently humorous rather than laugh out loud hilarious. Which is as it should be. The kind of funny that isn't aimed at damaging anyone. Instead it's comforting and constructive, offering the emperor a new set of clothes rather than mocking his nakedness. Plass and Lucas give you the kind of smiles that assure you you’ve learned something new and it’s changed how you think. That humour that enlightens rather than the hilarity that dazzles, then vanishes without a trace. Easy to dip into or read right through in an afternoon, The little red and black book is what you’d expect from the title: a bitter sweet blend of gentle humour and real life honesty to help you get life into perspective; not Jeff and Adrian's perspective and not your own, but - maybe, just a little nearer God's. Get serious and find funny too.